But also, I have to say, just as a progressive African-American woman, they give me a lot of hope. They strengthen me. They really formed that bond that means a heck of a lot when you’re in a Congress where—for example, in 1998, I was only the 20th African-American woman ever elected to Congress since 1789. So, this is really quite a happy moment and a really profound and positive development for the country. Absolutely. You know, it’s good to have allies. 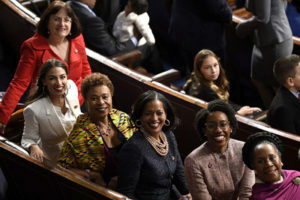 And coming to Congress then, as a progressive African-American woman, it took a while to build the level of collegiality that others have, especially white men, because there were so few of us. So, I remember those days, and we’ve made a lot of progress, but let me tell you, we have a long way to go. You still have institutional biases, you must break through all that sexism and racism. You must really confront that all the time, whether it’s subconscious or conscious. I think they all are very courageous, and all must know their bottom lines, what they bring to Congress, their values, who they are, and what they stand for. And it may not be the same thing, but you must know how far to go for compromise, or how far you will allow yourself to go on any given issue. For me, as a daughter of veteran and someone whose dad was in World War II, Korea, and who was raised in a military family, I know that the use of force should only be the last option, recognizing that we must make sure that our national security is secure. So, for me, that’s a bottom line. For me, another bottom line is you do not cut public assistance and food stamps. I had a very difficult period in my life—I was a single mother with two young sons. And I was on welfare and food stamps and Medicaid. And I knew what it was like, and it was hard. But in that moment because I had this bridge over troubled waters, like a lifeline, I’m not gonna allow, on my watch, my involvement in cutting any of this basic support for people and families and children who need it. And I’m gonna look out for others who may be in similar circumstances. So that’s a bottom line for me. [The new members of Congress] come with a lot of courage. Just to get here took a lot of courage—to break through, given the fundraising barriers and everything that you must deal with. But now they’re here, and they’ve demonstrated how courageous they are. They just must know how far they’re willing to compromise and what they stand for. And I think most of them know that. I hope I am a supportive peer who can really help them navigate the legislative process and do exactly what they want to do in their congressional career—serving their constituents and how they want to go, what path they want to take. And now as a co-chair of the Steering and Policy Committee, I want to make sure they’re able to get to the committees that they want—to carve out what issues they want to address. In terms of the seniority system and how you navigate that—I’ve had a lot of experience … [with] ways to think out of the box and be creative in what I want to do when there are systemic and institutional kinds of roadblocks. So, I want to help [new members of Congress] figure those out. But also, I must tell you: They encourage me, and they give me a lot of insight, and I learn a heck of a lot from them. It goes both ways.